A complicated mix of sawn lumber, structural beams, metal connectors for a straightforward roof. Carpenters are typically very good at producing in the field what they’ve been asked to produce, whether by customers, architects, engineers or the set of construction plans. Frequently we disagree with the design as-drawn but follow along nonetheless – either for expediency or out of a sense of obligation. Recently I was faced with just such an instance. My most recent project, at the “day job”, involved the addition of a 16’x16′ shed-roofed master bedroom to the footprint of a mid-90’s home. Both an architect and a structural engineer were involved with the planning, so I had a clear set of marching orders, but a less-than-clear set of construction documents. To a carpenter a shed roof is among the simplest roof designs to execute – one basic rafter shape repeated across the width of the building. In this circumstance however the engineer wanted to reduce the load that the new roof would add to the existing structure and spec’d a substantial load-bearing beam to carry the roof load. 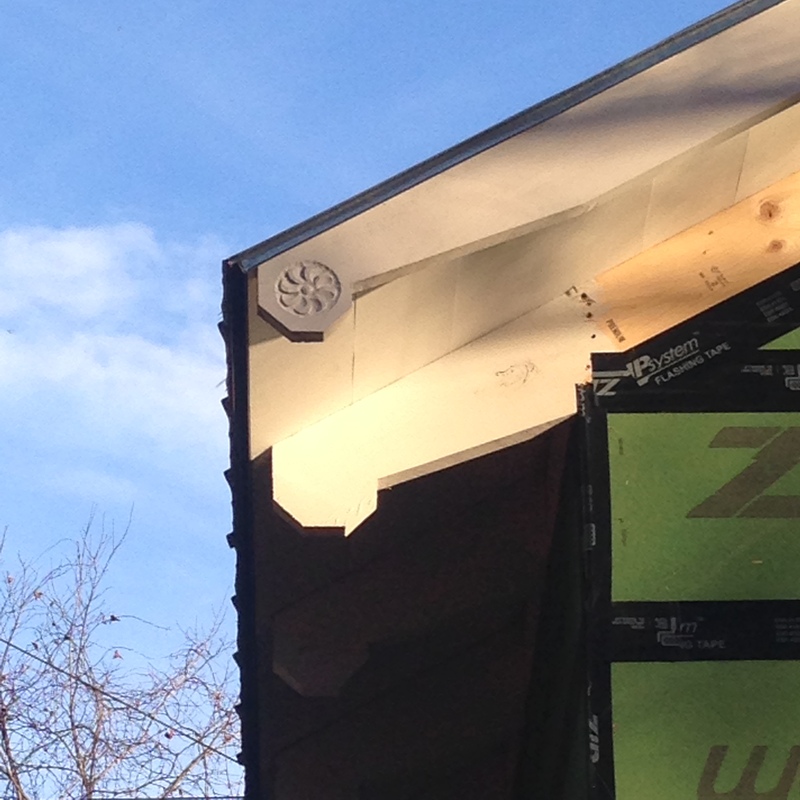 Concern for snow loading lead to massive 3-ply LVL beams taking the place of most of the standard rafters. Worries over carrying the load of the eave overhangs led to cantilevered outlooker rafters running perpendicular to the main rafter layout. All of this was tied together with a veritable hardware store of specialized metal connectors, structural screws, and nails. And time. Lots of time. In the end, the structure is complete. We were capable of the work, the home will never be challenged by the stresses placed on it by snow or wind, and the project continues. Was it worth it financially, time-wise, to “complicate” a simple roof with massive (some might say overwhelming) structural interventions? Hard to know how that will wash out in the end. As a carpenter, I feel like I added some new tools and techniques to my repertoire. As builders we had a productive back and forth with the architect and the engineer, in the end submitting to their design choices as their names and professional certifications were really on the line, not ours. The real answer, I’d guess, is somewhere in the middle. This entry was posted in Uncategorized on March 24, 2019 by Isaac Guenther. Carved rafter tails showing the remains of layout in pencil. Building houses costs a lot of money, and one of the first things to fall by the wayside is extraneous decoration. I think that’s a shame. With just a bit additional effort we can add a little beauty and whimsey. Social media and the internet allow the once-cloistered craftsman an enormous window to the world of fellow makers — an opportunity for instruction and inspiration and a forum for discussion. A recent thread of craft blog writing following close on the heels of a carving master-class I was fortunate to attend has gotten my critical thinking/writing all fired up. Hashtags can be frivolous, but their larger implications, the “meta-” content of the entire conversation related to the hashtag, can carry some real weight. Examples here, here, and here. We know that words matter, and that we can use words in a powerful way to help to shape our sense of self and our place in the world. The meta-conversation with #Realcraft seems to have started in late 2014 with a British designer named Chris Eckersley and an essay written for a show called Real Craft . 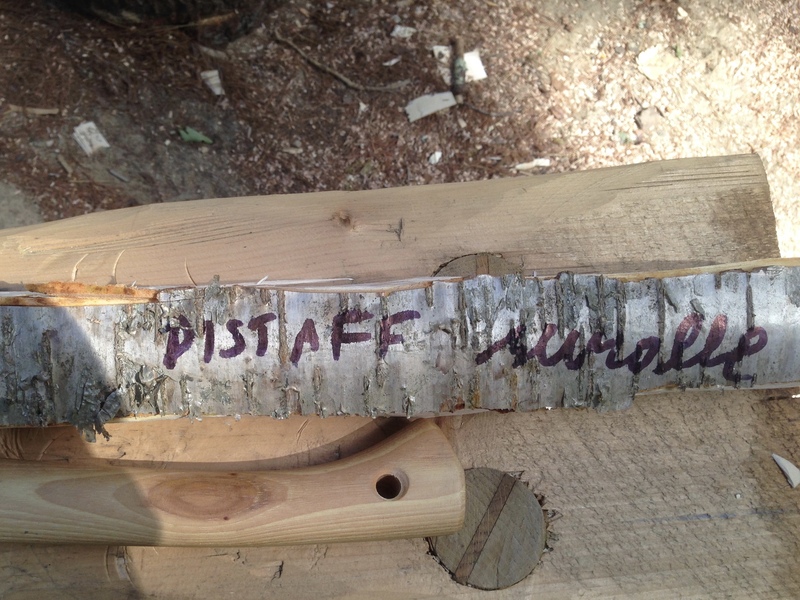 A response to Eckersly’s essay by English woodworker Robin Wood added a counterpoint. Jarrod Stone Dahl is probably where I initially picked up the thread, via his blog and Instagram. The most recent conversation has been mediated and motivated by Joshua Klein of “Mortise and Tenon” magazine, here, and here. Finally, some interesting input from Peter Follansbee. Each of these writers engages honestly in the conversation at hand and in their own way works away at what appears to be the crux of the topic: What exactly can be meant by this word/nonword “#Realcraft”? 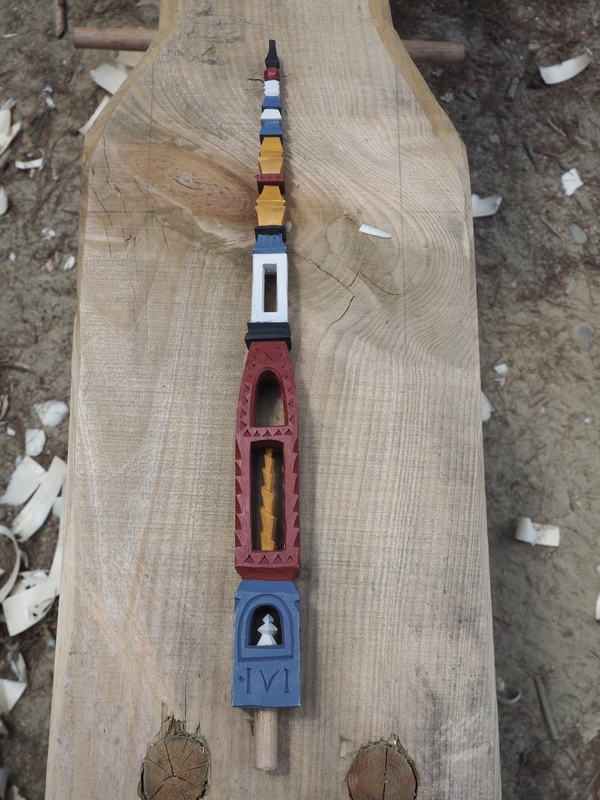 I found some insight for myself at the confluence where this theoretical discussion intersects with my own recent experience at Greenwoodfest, and a subsequent intensive carving masterclass, with the Swedish woodworker Jogge Sundqvist. Jogge Sundqvist is well known especially among woodworkers interested in green woodwork — work done typically with freshly felled, wet trees as raw material. 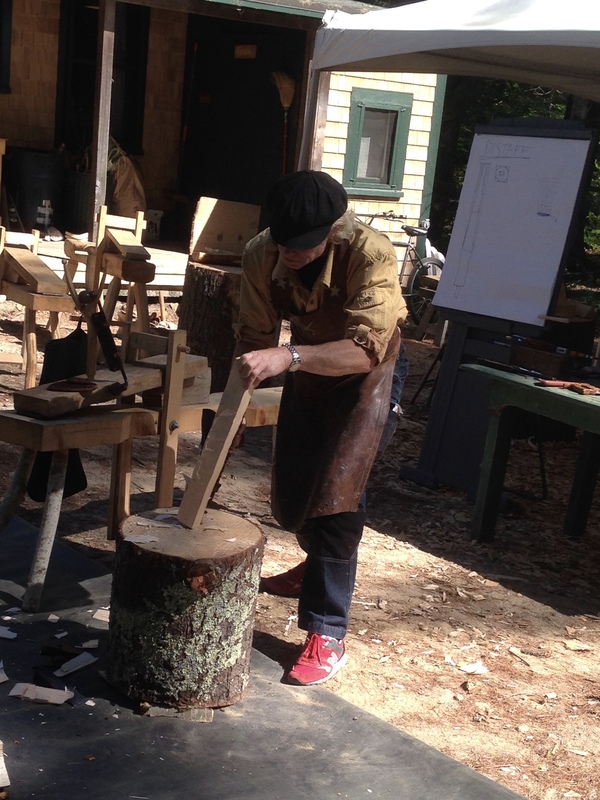 He is the son of Willie Sundqvist, who, via the guidance and interest of Bill Coperthwaite and Drew Langsner introduced the Sweedish sloyd (slojd) woodworking tradition to the United States. Jogge is a tremendous ambassador for traditional craft work, and is an impressive teacher. His personality is infused with curiosity, passion for his craft, and more than a little rock-n-roll. This was entirely in evidence when he presented a jaw-on-the-floor multimedia performance on the first night of Greenwoodfest. Entitled “Rythem and Slojd”, it began with Sundqvist roughing out a portion of a birch log with an ax to the driving beats of blasting techno music. 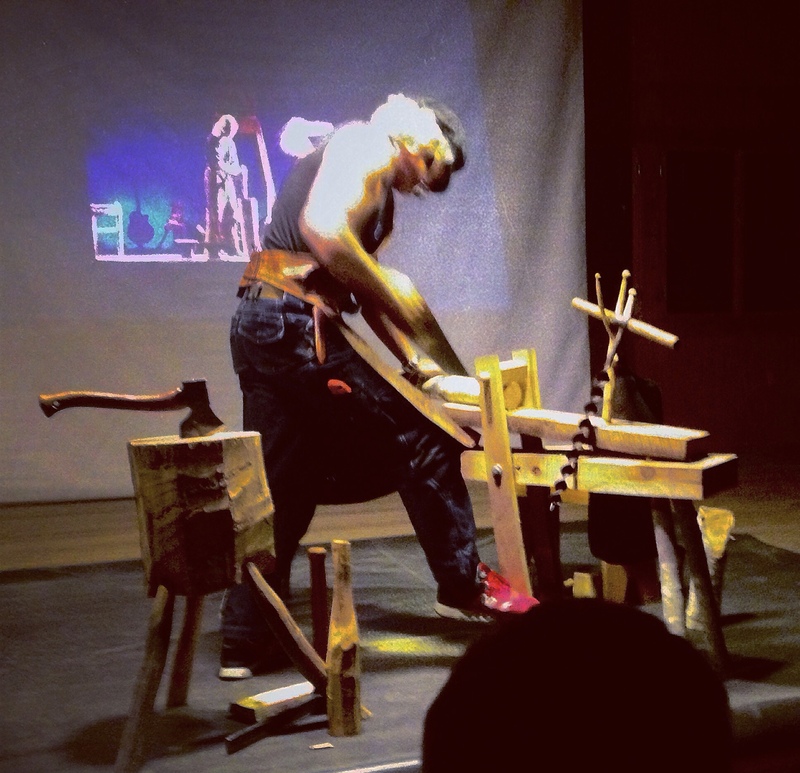 When he had worked the birch far enough in a rough state, the music came down, Jogge sat down, and, while simultaneously working away at the project in his hands, began to define for us the tenets of his craft: slojd. Slojd, he said, could be represented in the mind as a room with four walls, each necessary to hold up craft: the wall of tools and techniques, the wall of materials, the wall of tradition, and the wall of people and folk craft knowledge. Use of the proper tools, applied with skill to wood whose origin and qualities you are intimately aware, worked within and with awareness of the traditions and past practices of those who have come before and an awareness of the needs and desires of those for whom your work is intended, all integrated with the desire and responsibility to pass the skills along to the next generation, to foster the love and awareness of the work and the working life. This, to Sundqvist, was the definition of the word Slojdare, similar to the english word craftsman, if that word could be intended with all the foregoing implications. This, in turn, is how I would suggest #Realcraft be defined, in the evocative, multilayered language of the slojdare. Eckersley and Wood focus largely on the longstanding handmade/machinemade, artwork/craftwork conversation. It’s an important conversation, but works along the edges, is unsolvable, and as such, doesn’t break much new ground. Klein shoots straight for hard boundaries, using his own strong opinions, a dictionary, and David Pye’s problematic definition of the word “craftsman” in relation to the workmanship of risk. I think there’s too much “If this, then that” to Klein’s analysis, too intense a focus, and as a result, he needed walk his initial essay back a bit. Credit is due for jumping in with both feet, however. Follansbee gives himself an out, with the caveat that he “doesn’t usually get involved” with these types of conversations, and that the “heat has fried his brain”. I think he’s being a bit obtuse initially, picking up on the literal “real” vs. “unreal” crafts, poking at Jarrod Stone Dahl’s use of “real” as a marketing ploy, and his assertion that the way other people work “…means nothing to (him)”. Follansbee’s cagey though — if you’re aware of his work, his devotion to teaching his craft, and his place in the lineage of american craft tradition you know he’s pretty #realcraft. There is something about meeting new folks, carving together and sharing stories about life and craft that strikes a deep feeling in me. These experiences solidify the many facets of what I call Realcraft. It’s the people, food, stories, skills, life, the sharing, etc.. the real life backstory to the images on your favorite social media platform or “how to” video on Youtube, blog, etc… that defines Realcraft for me. …I know this may seem to be quite a story, but craft objects and stories go hand in hand and as makers we tell our part too. If you ever listen to folks talk about there prized wooden spoons, wooden bowls, hand thrown mug, hand made knife, basket or what have you, telling stories are part of it. If folks have taken a workshop were they make things with their hands, telling stories is very much a part of that too. There is always a story, a memory. The story is what makes these things, the handmade, an inseparable part of our very human existence. They are a part of us in this way. There is also something imparted into the object itself too. It’s the Handmade. They are steeped in the story of the maker, the thoughts, feeling while it’s being made. They are steeped in the thoughts and feeling of the owner or owners as well. There’s earnestness, awareness of tradition, concern for the future of craft, the continuing thread of craft through life and work, the people making and using. I think Jarrod’s slojdare for sure. 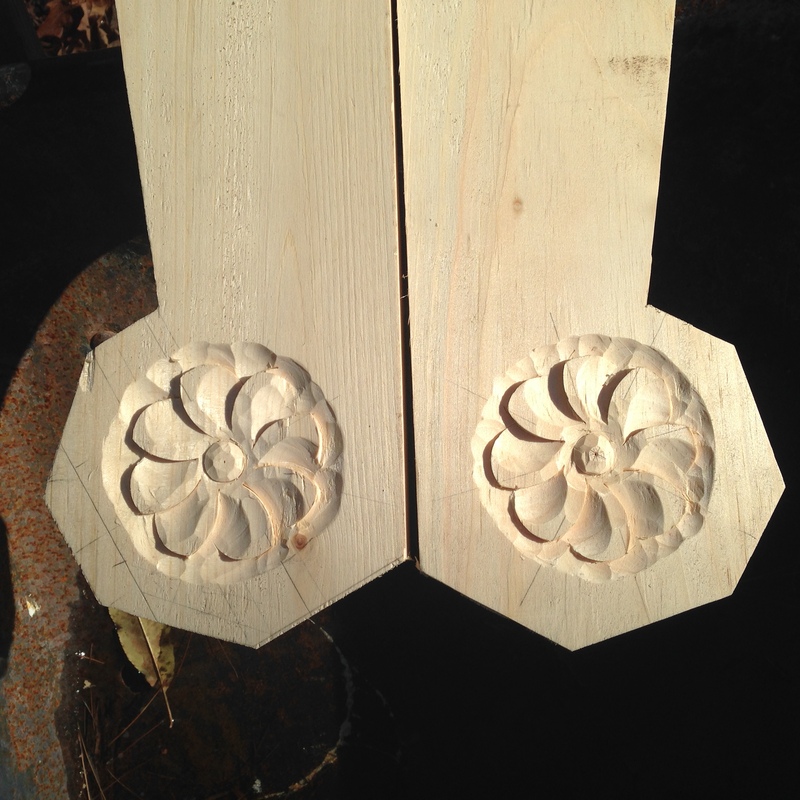 Heady stuff, up there in the theoretical ether, but brought home in a meaningful and direct way for me in the days immediately following Greenwoodfest as I had the opportunity to work with Jogge Sundqvist over two intense days in his class Distaff: The Passion of Carving. The distaff, a traditional implement used in spinning flax fiber into linen, was the vehicle via which I came to begin tounderstand what it means to be a slodare, and as a result, develop these thoughts about #realcraft. The object itself would be a commonly found, handmade, household tool. In Swedish craft tradition a common object might be elevated in significance through additional care and intention in making to the status of “loving gift”, a gift given to woo, to show care and love, to indicate through your personal attention that you were “not uncrafty”, suitably skilled. 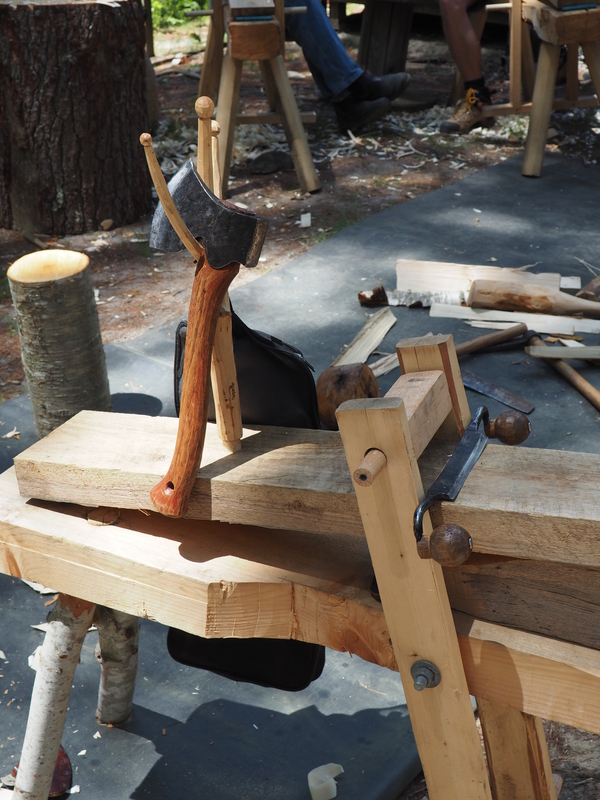 We were shown and learned to select and process a birch log with an ax and froe, to create a regular, symmetrical form with a drawknife and shave horse , to carve and pierce with a knife and brace, to embellish with carved decoration and color. This class integrated tradition, skills, materials, and people — theory actualized in the real world. For someone concerned with craft, with the working life, with learning and teaching, living fully and happily, I can see how the meta-conversation revolving around #Realcraft, a crazy collaboration between traditional craft knowledge and contemporary social media, could help to open the doorway to the integration of theory and form in life by helping us to see that we’re not alone out there. This entry was posted in Green Woodworking, Uncategorized, Woodworking and tagged craftsmanship on July 31, 2016 by Isaac Guenther. This won’t be news to big-time homebuilders in the tract-housing trenches, but for a small-time, detail-oriented construction firm in a small market, using pre-manufactured components on our current project has really improved our efficiency and, frankly, our quality of life as carpenters. Manufactured truss joists — 24 foot clear span. 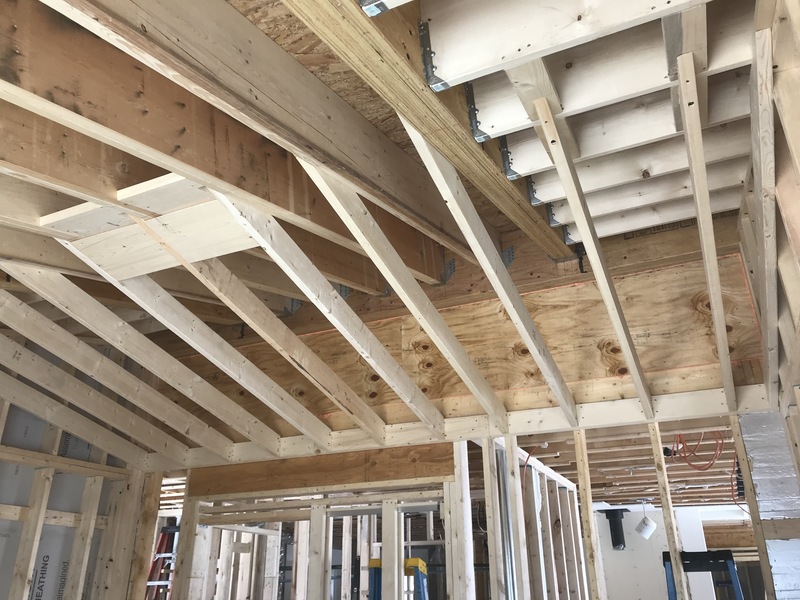 The architects for this project spec’d truss joists, and it is the first time that we’ve installed this product. Because of the engineered load-bearing nature of this type of floor system bearing walls and beams are eliminated in favor of clear-span floors — significantly speeding up the vertical progress of the home. The definition of lightweight construction, 24 foot joists are light enough for a single carpenter to maneuver around the site. The plumbing and electrical contractors will appreciate the open nature of the truss construction, speeding installation. The very top of the roof trusses. The mountains are nice too. Roof trusses are, again, nothing new to most builders. However, given the low overall project volume of the company that I work for, we’ve had occasion to frame roofs traditionally as frequently as to use trusses. While their outright size and weight necessitate having a machine on site to lift the trusses to the top plates, this inconvenience is mitigated by the speed with which the roof framing can be accomplished. We’re framing a house in January, in the Northern Adirondacks, so speed and simplicity are a real bonus. Even given the less-than-ideal consistency from truss to truss they are less aggravating to install than sawn 2×12’s. Pre-cast concrete piers for deck footers. Finally, another new product to our crew, pre-cast concrete footers. The overall design of the home is very straightforward — it’s a rectangle. The home does have a bump-out mudroom, breezeway, deck, and screen porch, however, and all of these “exterior to the footprint” components are supported by piers. On past projects we would have set sonotubes and mixed concrete by hand: tedious, time-consuming work. While the number and location of piers was significant and complicated, the work could be accomplished quickly and accurately by one person (in this case, the boss) and a small back hoe. Further functionality and efficiency will be realized while framing on top of these piers as threaded anchor nuts are cast in place. I’m writing about my day job here because this topic furthers my interest in best building practices and efficiency in my work life. In this case the company performing the work is not Guenther Woodworking, but Crowl Construction, of Keene, New York. Brian Crowl can be reached at crowlbuild@localnet.net. If you’re looking to build in the greater Keene region of the Adirondacks, this is the company to call. This entry was posted in Homebuilding, Uncategorized and tagged best-practices, home building on January 18, 2016 by Isaac Guenther. 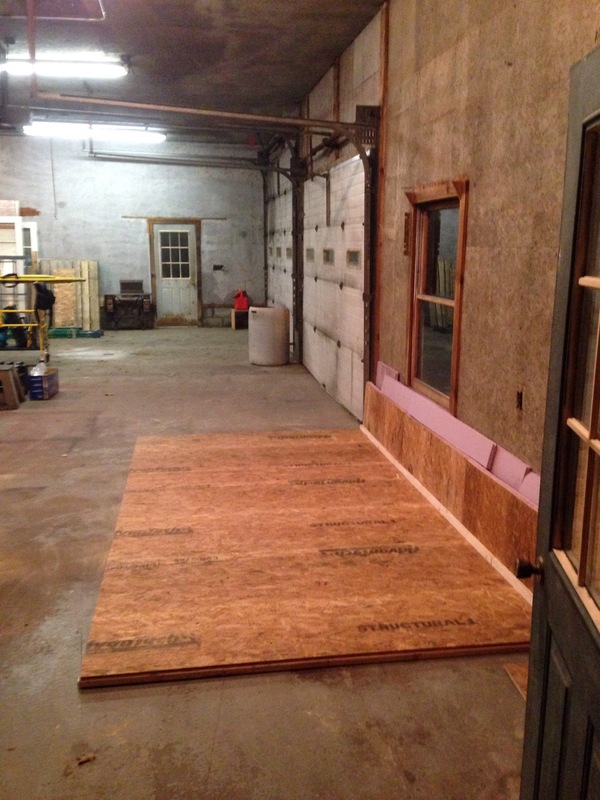 Excited, and a bit nervous, with the advent of Guenther Woodworking’s winter workshop. Plywood floor will be for my workbench and hand tool work. Northern light, too! And heat! Shared garage space so that some of my longstanding projects have some room to breathe, and hopefully get completed. 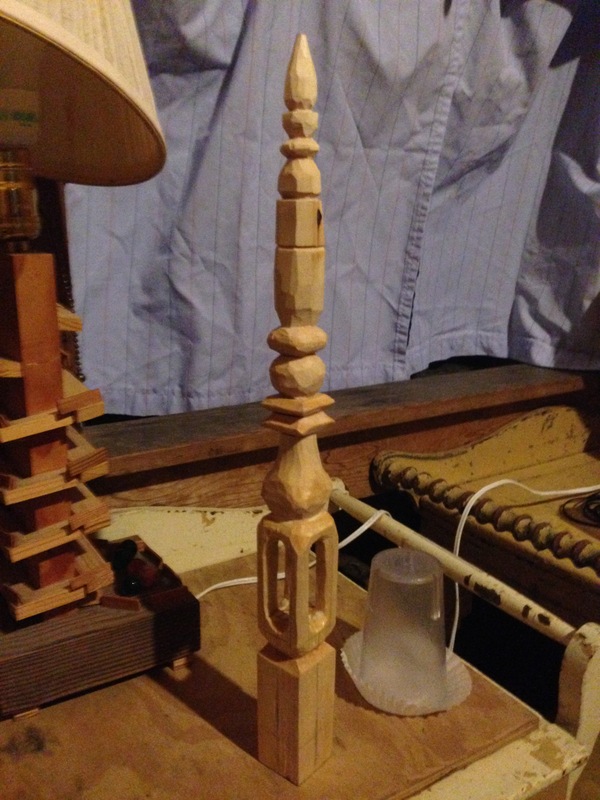 This entry was posted in Uncategorized, Woodworking on December 1, 2015 by Isaac Guenther. Both signs mounted in their new home. Lovely clear cedar post. 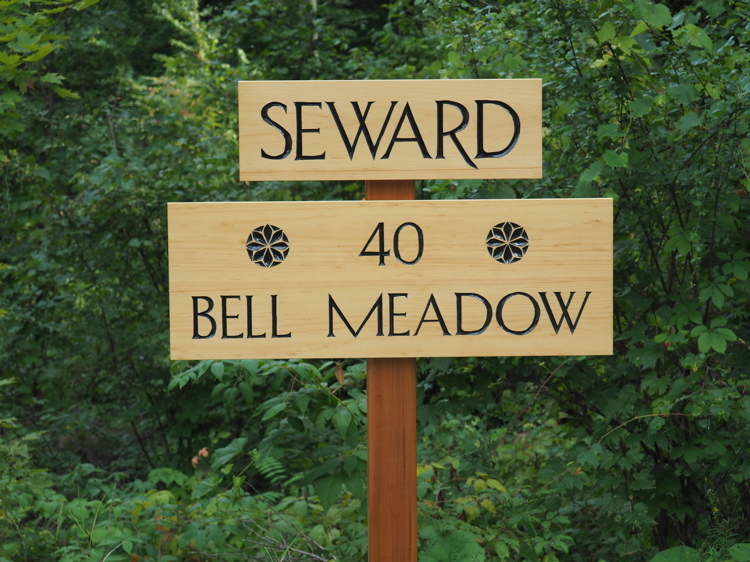 I recently installed a pair of hand-carved address signs for clients in a nearby town. Their primary request was the the signs conform to their “Quaker sensibilities”: simple script, subdued paint selection, unobtrusive (read: not shiny) exterior finish. The name panel has four-inch Gothic script, and the address panel has three-inch Gothic script with the street number bookended by chip-carved rosettes. The signs are of clear Adirondack Eastern White pine, the script highlighted with General Finishes black Milk Paint, final finish with Interlux Schooner varnish rubbed out to matte with synthetic steel wool. Please check out the full slideshow of the project: initial pencil layout to finished installation. This entry was posted in Uncategorized on August 30, 2015 by Isaac Guenther. 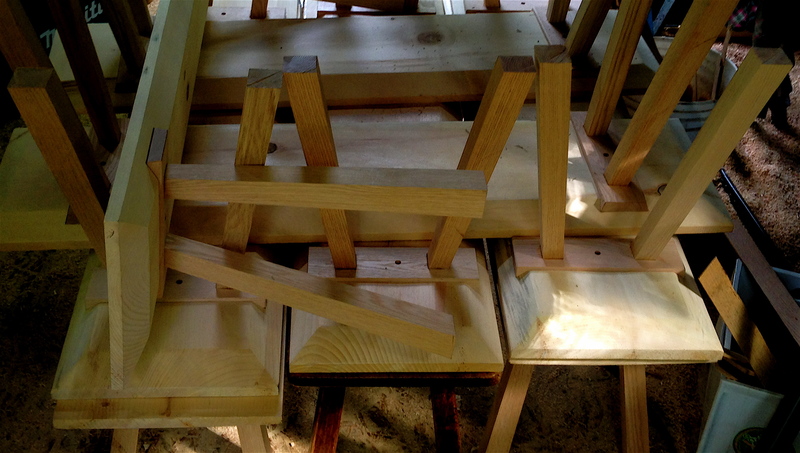 Pine benches with tapered oak legs. This entry was posted in Uncategorized on June 20, 2015 by Isaac Guenther.